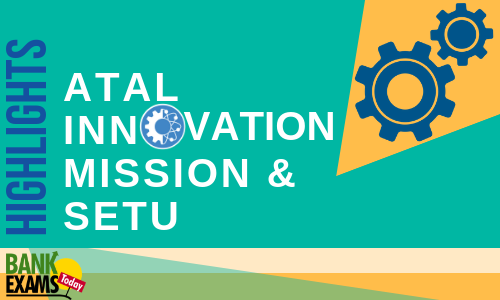 In the budget 2015- 16, Finance Minister announced the Government's intention to establish the Atal Innovation Mission (AIM) and a mechanism to be known as SETU in NITI. Initial sum for this mission is Rs. 500 crore and Rs. 1000 crore respectively. To implement this mission AIM and AIM Directorate will be established in a focused manner and the headquarters will be in New Delhi. Mission High-Level Committee (MHLC) will not only guide the Mission but also take all decisions related to approval of requisite guidelines and implementation. NITI Aayog constituted an Expert Committee under the Chairmanship of Prof. Tarun Khanna, Director, South Asia Institute, Harvard University, USA, on Innovation and Entrepreneurship to work out detailed contours of AIM and SETU. Also, recommended the need to establish clear systems to monitor the implementation, execution, and impact. SETU (where the innovators would be supported and mentored as successful entrepreneurs). Budget cost Rs. 500 crore and Rs. 1000 crore respectively.